All those who value life and peace must join forces to prevent arms smuggling, so that Israel can continue to ease restrictions on the Palestinians. Today (March 10) a briefing for foreign ambassadors in Israel was conducted by Deputy Foreign Minister Danny Ayalon and Maj.Gen. 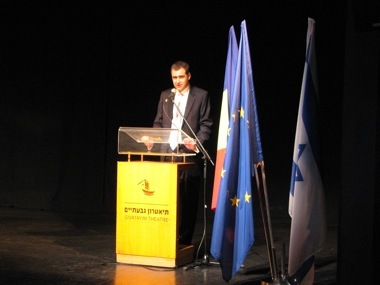 Eytan Dangot, Coordinator of Government Activities in the Territories (COGAT). The subject of the briefing was the implementation of the civilian policy in Judea and Samaria and towards the Gaza Strip in light of the dramatic changes in the region. After reviewing the government's policy of easing restrictions in Judea, Samaria and the Gaza Strip, which has brought about significant economic growth in both areas (9% in Judea and Samaria, and 16% in the Gaza Strip), DFM Ayalon concluded, "Israel aspires to continue the easing measures. At the same time, the complexities of this region and the recent dramatic changes have intensified the threat of arms smuggling that endangers Israeli citizens in the southern and central parts of the country. "Unfortunately, you and your families living in the center of the country also understand the this is a very real threat; the range of the rockets reaches all of us and already today thousands of rockets are stored in the Gaza Strip that threaten the population in Israel. "We call on the international community and all in the region who treasure life to join forces to prevent the arms smuggling. The rockets threaten not only Israeli citizens, but also the citizens of the Gaza Strip who also long for a normal life. The continuation of the smuggling will interfere with Israel's ability to ease restrictions for Gaza residents. All those who value life, whether they are Egyptian, Tunisian, Jordanian, Israeli or Palestinian, together with the international community, must stop the Iranian infiltration. "From here I call on the international community to put pressure on Hamas to release Gilad Shalit, who does not receive even the most basic human rights." In response to journalists' questions regarding Denmark's upgrading of the status of the Palestinian delegation, DFM Ayalon called it "a virtual upgrade that won’t change the reality on the ground. Whoever deludes the Palestinians into thinking that they can establish a state unilaterally, without negotiations, is diminishing the chances for peace and for a Palestinian state." DFM Ayalon added, "Palestinian obstinacy will not prevent Israel from making diplomatic progress and cooperating with the international community." 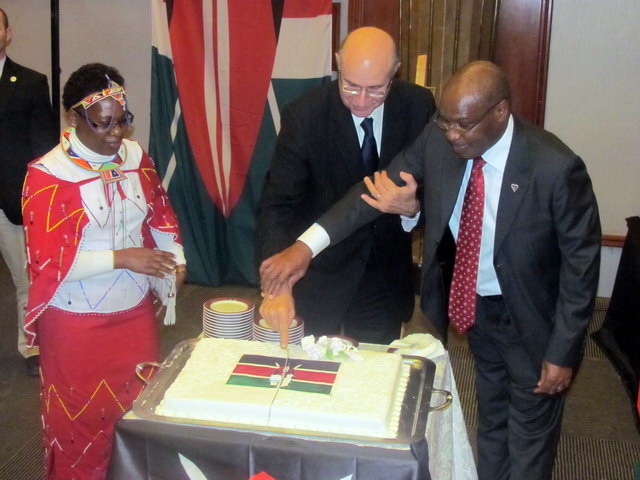 Marking his nation's Independence Day, the Kenyan Ambassador to Israel, Lt. Gen. Augostino S. K. Njoroge, delivered a rousing and heartfelt speech on Sunday December 12 at the Panorama Hotel in Tel Aviv. 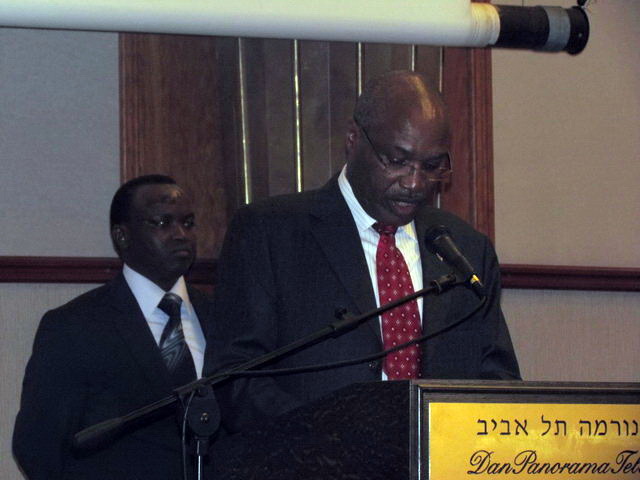 The African Ambassador spoke of the strong --and decades long--- ties between Israel and Kenya. 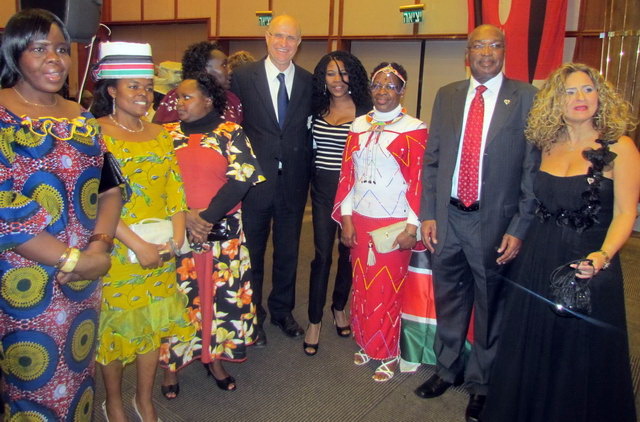 At the evening's social event, Israeli MK Avishai Braverman also delivered a speech in which he also spoke of the special ties between Israeli and Kenya, with his hopes for a strong future between the two nations. Giving a lengthy and all encompassing speech about the long-standing relationship between Israel and this African country, Ambassador Nijoroge began by offering his "heartfelt condolences to the families who lost their loved ones" while "praying for the quick recovery of the injured," in reference to the 43 deaths incurred by the massive forest-fire, which ravaged Northern Israel just a week earlier. The ambassador requested the audience to "remain silent for a minute for the departed souls." The ambassador's motif focused on the emphasis of the special bilateral relations between Kenya and Israel. "It has grown in leaps and bounds. Relations can be traced to 107 years ago when in August 1903 the then British Colonial Secretary, Joseph Chamberlain, offered Zionists a part of Kenyan territory, which was part of the then British East African Uganda Protectorate... at the moment, hundred of Kenyans of Jewish origin live and call Kenya their first home." The Ambassador emphasized that over the past 20-years, the powerful alliance was based purely on trade and economic cooperation; however, in the last decade, political bonds have improved along with the shared cooperation in different sociological fields. "It is my desire during my tenure as the ambassador of Kenya to the State of Israel to consolidate and strengthen the already existing ties even further," he said. "Let me extend Kenya's sincere appreciation for the technical support that the Israeli government continues to extend to Kenya through Mashav. The balance of trade remains largely in favor of Israel, mainly because ISrael has been exporting primarily to Kenya with regards to high-valued finished goods." In a kind gesture to underscore his admiration for the Jewish state, the Kenyan Ambasador offered "a toast for the good health of his excellency Shimon Peres, the President of Israel." This festive event also featured a host of various Kenyan dance and music with performers flying in from Kenya especially for the event. This showing of "soft power" by incorporating pieces of Kenyan culture to another eclectic culture like Israel remains a welcoming sight to the ever-changing face of international diplomacy. In her first appearance at an Israeli university, Brazilian Ambassador to Israel - H.E. 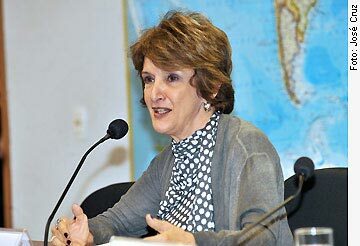 Maria Elisa Berenguer - addressed guests at Tel Aviv University and discussed the special relationship between Israel and Brazil as well as Brazil's newly accelerated diplomatic efforts across the Middle East. Assuming the post as ambassador only four months ago, Ambassador Berenguer expressed her amazement at both the fast paced environment in Israel and how regional events themselves are rapidly changing on a day to day basis. Mixed with its surging economy, it is these rapid developments that have motivated Brazil in undertaking a new diplomatic track as opposed to the country's previously held strategy of 'quiet diplomacy'. Those familiar with the latest current events in Brazil know that Latin America's most populated and largest country has become a thriving economic force as it has established itself as one of the top ten economic giants across the globe (as measured by GDP). With this, Brazil can only assume a greater role in world diplomacy while trying to expand its "friendly neighbor" policy worldwide and with special attention to the Middle East. In specifically addressing Brazil's foreign policy efforts towards Iran, Ambassador Berenguer explained that Brazil is adamant in its belief that all nation's have the right to a peaceful nuclear energy program and that her country is attempting a new strategy in approaching the Iranian government with regards to its nuclear program. Referring to the recent meeting between Brazilian President Lula da Silva and Mahmoud Ahmadinejad, Ms. Berenguer explained that, "He [President da Silva] had long conversations with Ahmadinejad about the Jewish people and stressed the importance in not denying the Holocaust." As Dilma Rousseff is set to assume the Brazilian presidency on January 1st (she will be the first woman to fill that role), Ambassador Berenguer stressed the importance in continuing to pursue a similar diplomatic policy towards the region. "Brazil has been a long time friend of Israel and worked very hard behind the scenes in favor of the UN's resolution, which lead to the establishment of the State of Israel," stated Ms. Berenguer. And although many Israelis may feel uncomfortable with Brazil's extended hand towards the Iranian regime, Ambassador Berenguer made it clear that Brazil will continue to pursue an agenda that publicly stresses the importance of Israel's security. Ms. Berenguer said she is looking forward to her stay in Israel and expressed her commitment to maintaining and strengthening the overall ties between her country and Israel. On Thursday, December 2nd, the Royal Thai Embassy in Tel Aviv hosted a gala honoring the King of Thailand on his 83rd birthday. The extravagant celebration coincided with the country's National Day. 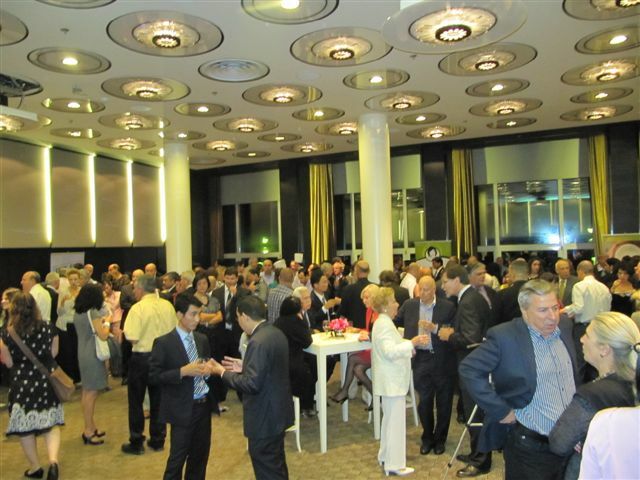 The event, celebrated simultaneously throughout many countries, brought together ambassadors and an array of representatives from the diplomatic community as they took part in the festivities, which also recognized the healthy relationship between Israel and Thailand themselves. 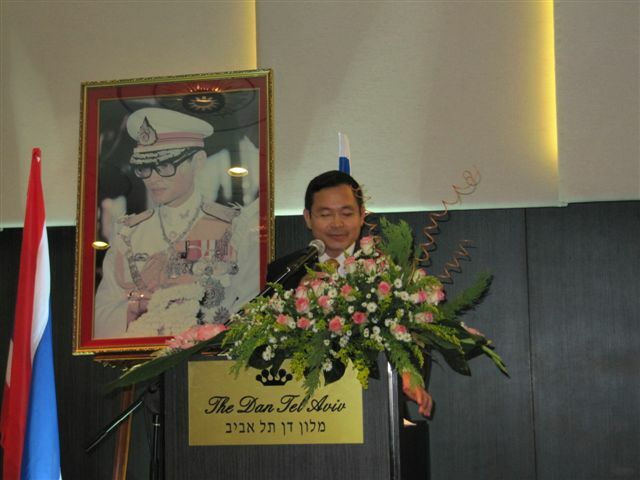 Ambassador of Thailand to Israel, H.E Chatchawed Chartsuwan commenced the evening with a brief speech in which he expressed his gratitude to the government of Israel, poignantly describing the strong ties that have united both countries over several years. Ambassador Chartsuwan said he was proud in acknowledging the fact that Thailand was one of the first Asiatic countries to recognize the State of Israel. Chartsuwanmade it clear that Israeli tourism to Thailand has had and continues to have a huge economic impact on his nation. According to the Thai Ministry of Tourism, roughly 140,000 Israelis visited the Southeast Asian nation thus far as 2010 comes to an end. 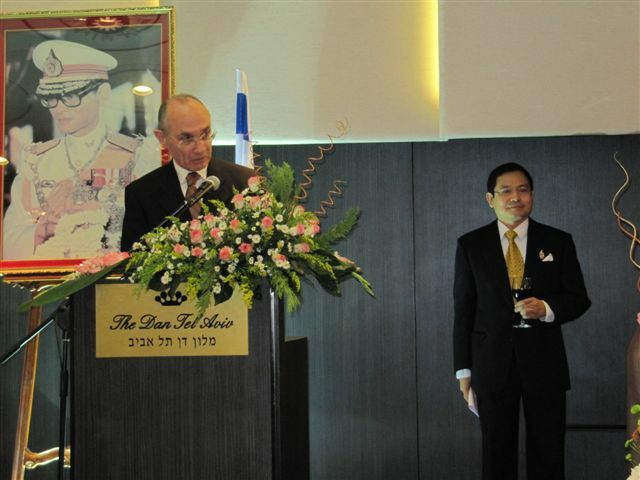 Another key point Ambassador Chartsuwan touched upon was the mutual benefit that both nations have been afforded from their scientific and technological cooperation as well as the artistic and cultural events presented by the Thai community in Israel, such as the Thai Festival in Haifa. These events, as explained by Chartsuwan have "consolidated a strong sense of pride and a future filled with unity between the two countries". In culminating his speech, Ambassador Chartsuwan discussed his intentions in deepening the cohesiveness between both countries, expressing that "in these times, one can neither ignore nor reject globalization." He also expressed his admiration for Israeli President Shimon Peres and the contributions that he has made to both the State of Israel and the global diplomatic community. Following the Thai Ambassador, Israeli Minister of Infrastructure and Development, Dr. Uzi Landau, expressed his warm regards for both Thailand's diplomatic mission to Tel Aviv as well as the entire Thai nation. "I came to speak as a representative of the people of Israel, wishing the best to your Majesty, the King of Thailand and all of his people." Dr. Landau also focused on the vast cultural and economic ties, most notably referring to the strong links over the past couple of years specifically. The majority of Landau's speech was dedicated to the impact that Thai immigrants and workers have had on the Israeli state itself. Referring to the agricultural contribution and influence, Landau made clear that "Thai immigrants in Israel have made enormous strides in furthering Israel's Agricultural landscape, and we cannot thank them enough." Not only did Landau express his desire for maintaining the strong commercial ties between the two nations; rather, he expressed the need for further cooperation in building a common agenda with mutual goals across many sectors – an agenda that will carry both nations towards future successes. Above all else, the evening was a great way to celebrate the strong achievements between Israel and Thailand while also honoring the rich traditions of the Thai Kingdom and its nation's history. Romania's rich musical traditions were on display Wednesday night at the Givatayim Theatre as some of the Eastern European nation's finest young talent performed before hundreds of guests in attendance in celebration of Romanian National Day. In honor of the country's reunification of Transylvania into 'Greater Romania' (December 1, 1918), Romanian National Day glorifies the storied cultural achievements throughout the nation's intriguing history. Undoubtedly, Romania's global contributions to the Arts is something that cannot be overlooked; rather, it is these contributions that have helped place the country amongst the world's most sophisticated centers for both the composition and performance of classical music. Thus, it was quite a privilege for those who attended the Romanian Cultural Institute's - in conjunction with the Embassy of Romania - sponsored orchestral performance honoring the country's heralded musical traditions of both past and present while also getting a glimpse at the the next generation of Romanian prodigies whom have gracefully begun to carry-on those traditions. The cultural evening commenced with the playing of both the Romanian and Israeli national anthems and was followed by speeches from Gina Pana, Director of the Romanian Cultural Institute in Tel Aviv, and the Romanian Ambassador to Israel himself, H.E. Edward Iosiper. In his speech, Mr. Iosiper discussed the already strong bilateral ties between Israel and Romania while also stressing the desire to see even greater cooperation between the two nation's. Iosiper, who has been posted in Tel Aviv since 2007 said that he was proud of the achievements garnered by both countries and that each can benefit greatly through the continued strengthening of those familial bonds. Romania, which has a large contingent of foreign workers in Israel, has also recently become a prime destination for Israeli travelers and is growing each year in regards to its tourism industry. 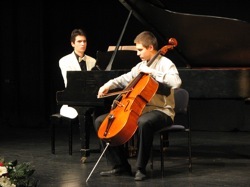 As the evening continued, the young musicians - all students of Romania's finest conservatories - performed pieces by George Enescu and Paul Constantinescu, two of Romania's most celebrated composers, as well as works by Tchaikovsky, Chopin and Robert Schumann. The focus of the concert was to honor both Romania's finest composers and a few of the more recognized Jewish ones. All of musicians - members of the "Dinu Lipatti" Group for Musical Excellence (Daria Ioana Tudor, piano (13 years old); Georgeta Ioana Iordache, violin (16 years old); Stefan Cazacu, violoncello (17 years old); Arthur Bocaneanu, piano (19 years old) ) - are well known both within Romanian philharmonic circles as well as those worldwide as they have taken their talents across the globe. They were accompanied on piano by Verona Maier, from the National University of Music in Bucharest. Producing classical music talent is definitely something of which Romania excels. So, as the festivities of Romania's National Day officially commence, diplomacy.co.il offers a special congratulations to the Romanian mission to Tel Aviv as well as all Romanian citizens currently residing in Israel.